HOME Africa T.B. Joshua : The man who sees tomorrow? He has a smile for everyone, yet many regard him as one of the most controversial prophets that ever walked the nation and beyond. Many have not stopped reminiscing on the Dana air crash which was reported to have been foretold, among many other prophecies, by Prophet T.B. Joshua of the Synagogue Church of All Nations. Face Of Malawi writes on the man and his prophetic declarations. IT was a usually religiously imbued Sunday—June 3. Major roads led to religious centers with obliviousness written in the air. The hours traveled, morning gave birth to noon before catastrophe struck. The Dana Air passenger aircraft crashed around 3p.m. in Lagos, killing all that traveled in it including a few on ground at the spot of its crash. It was one of the bleakest Sundays in the history of the nation. While the nerve-shattering news rent the air, plucking tears from the eyes of many, people began to recollect that precisely on February 2, this year, Prophet T.B. Joshua, the highly revered pastor of the Synagogue Church of All Nations, located in Lagos, called upon all that cared to listen to pray and fast, especially for those flying within Nigeria. Joshua was reported however to have said the crash would be due to a security challenge. The prophet, in his admonition, had prophesied that a plane crash would occur and it would claim many lives including that of top government officials. This was eventually so on the Dana crash. 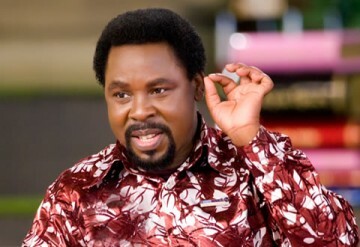 His prophecy was published on February 2, this year by the Nigerian Tribune. It would be recalled that it had become quite characteristic of this man in the synagogue of chipping in precise prophetic utterances during his sermons. Some, he would speak out rightly, others, he would speak in shrouded parables. Many of his counterparts in pastoral work have usually found his methods quite controversial. He was equally reputed to have predicted the death of the music legend—Michael Jackson, including the death of the President Mutharika of Malawi which equally happened. With the death of so many lives in the Dana air disaster and following the exactitude with which his previous prophecies had come to fruition, many Nigerians, irrespective of religious leanings have been forced to raise some questions concerning the predictions of this man in the Synagogue. Could listening and acting on the prophetic utterances of Joshua be the reduction of sudden deaths? Would the over 150 lives lost at the Dana crash being saved if close attention had been paid to the predictions of Joshua? Could the prayer and fasting recommended by the prophet have saved the day if the proffered spiritual exercise has been observed across the length and breadth of the nation? Many football fans would also recall the prophet’s prediction in the final round of the last UEFA Championship. Despite being viewed as puerile, many who felt directly concerned took the prediction serious, just as others took it with a pinch of salt. There are also reports that Joshua had predicted World War III should Iran and Israel go to war. Joshua claimed that if the war started, it would be the longest and worst in human history. Just as Joshua commands so many followers who believe strongly that his ministry is of God, many others both within and outside the country also cast aspersion on his spiritual methods. For instance, it was reported that the Cameroonian government blacklisted Prophet T.B. Joshua from its country on charges of anti-Christian practices. Many people have wondered about the power with which he performed miracles and gave prophetic utterances. But the prophet has repeatedly insisted that he is just an instrument in God’s hands. In interaction with some select foreign observers who had come on a pilgrimage to the church, the prophet spoke of how the church started. According to him, “People would call me and ask me to pray for them. If they want to play football, I would pray for them. They began to come to me individually for prayers. It was pray for me, pray for me, pray for me all the way. You see, God Almighty is awesome. He can use any medium to express Himself. He can use sand, water, stone, rod, he can use anything. “When Moses was asking God, what should he do, God asked him: “What is in your hand?” He said rod. Then God said: “Use it to divide the sea.” Or are you talking about Paul and Silas in the prison yard? They were there and they never said: Hey, in the name of Jesus, in the name of Jesus, in the name of Jesus. They just sang praises to God. The used the medium of sound. Or are you talking of Joshua. He said to his people to just shout Alleluia and the walls of Jericho fell. God uses any medium to express Himself. While the nation is still unable to overcome the devastation of the Dana air crash, many would perhaps begin to take serious the prophetic utterances of Joshua.